They’ll learn three important kids kitchen skills, including using a blender, cooking at the stove and using a spatula. This easy treat takes just 10 minutes of hands-on time for kids while learning how to combine milk, eggs, butter (melted and cooled), sugar, vanilla extract, salt, flour, confectioners’ sugar and optional maple syrup. Cook the crepe for about 1 to 2 minutes, or until lightly browned. Then flip it over with a spatula and cook the other side for 1 to 2 more minutes. Continue making the crepes until all the batter is used up. Place a crepe on a plate and add a handful of berries to the center. Roll it up and sprinkle with a little confectioners’ sugar. Drizzle with a little maple syrup, if you’d like. 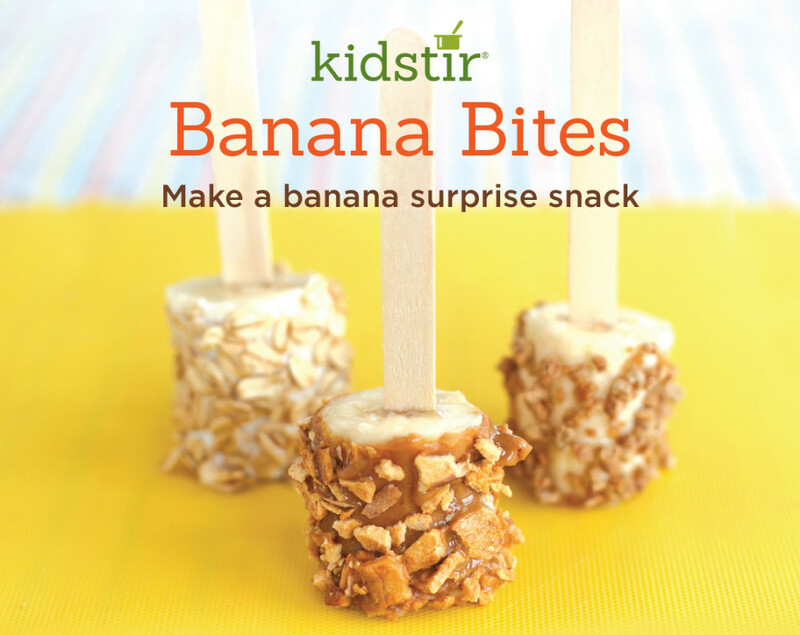 This fun-to-make Banana Bites Snack recipe will disappear fast at the breakfast table. Slice up bananas, spread on some seed or nut butter, and sprinkle on yummy toppings for a good morning surprise. This recipe is a wonderful sensory activity for kids (they get to experience different foods with textures from smooth to sticky to crunchy). The kids can make it together with a friend or sibling. Encourage them to experiment with different spreads and try toppings to get creative. It can be a little messy, so keep paper towels nearby for wiping sticky fingers. First, peel each banana. Cut off the end, then peel away the yellow part. Lay the bananas flat on a plate or cutting board. Use a plastic or butter knife to spread a thin coat of nut or seed butter, honey, or yogurt on all sides of each banana. You can coat the fruit on the cutting board or plate or hold it upright with one hand. Now get your toppings ready. Use a rolling pin to crush the apple chips, graham crackers, or corn flakes. Pour the crumbs onto a plate. On a separate plate, place the granola or other cereal. Sprinkle a topping over each banana, turning the fruit until it’s coated on all sides. Gently press the topping with your fingers so it sticks to the nut or seed butter. Cut the bananas into bite-size pieces (about 1 to 2 inches). Trim the ends flat and stand them upright. Eat with a fork or add a popsicle stick—like we’ve done—for more fun! Exciting news for your little chefs! 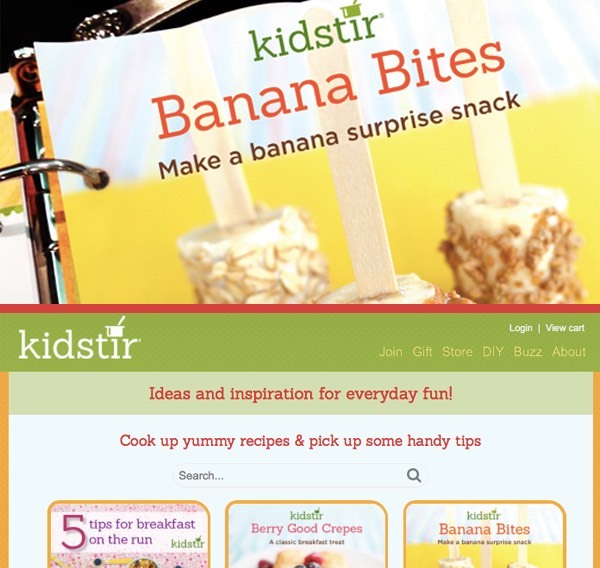 Now, all the fun and yummy recipes on our website are printable and sized to fit perfectly into your Kidstir cookbook. Visit our DIY section, click on any of the recipes and look for a printer icon. So easy! Go ahead! 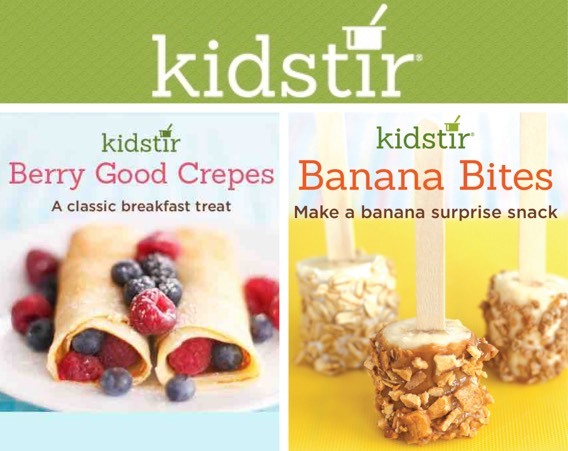 Make something new and add it to your Kidstir recipe collection!